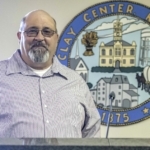 I am a life-long resident of Clay Center, minus six years in which I spent in the U S Navy. I own Thatcher Drywall and have been self-employed for approximately 20 years. The reason why I chose to run for Mayor is to give back to the people of Clay Center and to ensure that the community continues to be a progressive one. I have been married to my wife Cyndy for 24 years, and have a daughter, Leah.